The Communications Center is part of the Support Division and is under direct supervision of the Support Services Division Commander. Communications is staffed 24 hours a day, 7 days a week. Also known as a Public Safety Answering Point or “PSAP” the Communications Center operates an enhanced 9-1-1 system. This means that all 9-1-1 calls received at this PSAP are displayed to a computer screen. The information available to a dispatcher will typically include the name, address and telephone number of the owner of the property and a list of those emergency services, i.e. police, fire and ambulance, that respond to that location. The communications center operates 24/7/365 and is supervised by the Support Services Division Commander. The Enhanced 9-1-1 system is designed to speed the response to emergencies. The dispatcher does not need to solicit the information that is already displayed. In many instances callers are emotionally charged, which can consume valuable time. In every instance however, a dispatcher will verify the information with the caller to ensure that a response is made to the actual location of the emergency. It is not uncommon to receive a 9-1-1 call from an individual who had been speaking with a relative living in another town, when suddenly that relative falls ill and needs medical assistance. When you create a safety profile at Smart911.com, it gives our dispatchers the information they need to help you fast should you ever need to call 9-1-1. Smart911 allows you to create a Safety Profile for your household which will proactively provide details on your family and home that 9-1-1 dispatchers may need in order to send help in the event of an emergency. Smart911 then delivers this information automatically with any 9-1-1 calls that are routed to our 9-1-1 center. You decide. Smart911 allows you to store any critical care and emergency rescue information online in advance of any emergency. Information can include children’s photos, medical conditions, home addresses of mobile phone callers, disabilities or other rescue-related information. When a 9-1-1 call is placed, this information is displayed to our dispatcher to provide a quicker and better informed response to your emergency. Our dispatchers can initiate 2-way text conversations with any mobile caller. If an emergency caller is non-verbal, disconnected, or has poor coverage, 9-1-1 call takers can easily contact them to send help or verify accidental dials. Our dispatchers play a vital role in helping police to locate missing persons, fugitives from the law, or others whose safety may be in jeopardy by locating cell phone and other wireless device subscribers. Using data from the RapidSOS Clearinghouse, our dispatchers have access to highly accurate 9-1-1 caller location data using best available smartphone technology including GPS, Wi-Fi, and beacons. Aside from utilizing GPS and triangulated location portion of the enhanced 9-1-1 data from cell phone callers, dispatchers can work closely with police and wireless service providers to “ping” the location of a subscriber’s cell phone to locate them in an emergency. This capability has also been successfully used during the investigation of major crimes to provide evidence of an offender’s location. Head over to www.Smart911.com to create your Safety Profile. It’s free, private, and secure. It’s important to keep the information in your Safety Profile up to date! Make sure you update your information whenever there is a change, and confirm any unchanged information no more than every six months to ensure that emergency responders are provided with accurate information when responding to an emergency. A voice call made from a wireline or cell phone is preferable, but in the event that you cannot do so safely or practically you can send a text to 9-1-1. A voice call is always the best option. Talking to a 9-1- operator is the fastest way to relay your information, so the operator can send the right kind of help. However, if you’re in a situation where speaking could put you in danger, or if you have trouble hearing or speaking, sending a text to 9-1-1 could be your best option. Your messages will be received by a text-capable 9-1-1 center and the operator will relay your message to our agency. Keep in mind that if you are at risk, you must silence your phone, so you don’t put yourself into a potentially more harmful situation. If your phone makes a noise, you could reveal your location and put yourself in real danger. Question: How do I send a text to 9-1-1? How do you send a text to 9-1-1? First, open the message app on your phone or wireless device. When you're entering the text address, just type "911." You don't need to put any spaces or dashes between the numbers. In the message field, type in your exact location, including the address and the name of the town or city. Be as detailed as you can. If you don't know the address, type in the names of the streets at the nearest intersection or a description of any landmarks nearby. Next, give a brief description of the problem. Then, press "Send." Keep your messages brief and to the point, and avoid using slang and abbreviations. The 9-1-1 call taker will ask you questions, so never leave the conversation until the call taker has told you to do so. Question: Can I send pictures and videos to 9-1-1? Pictures and videos can't be sent to 9-1-1, so only use text. Question: Can I include more than one person in my text conversation with 9-1-1? Question: Will it show my location? Texting to 9-1-1 is different from making a voice call to 9-1-1 in this respect. When you make a voice call to 9-1-1, the call taker will typically receive your phone number and your approximate location automatically. This is called "Enhanced 9-1-1" or "E9-1-1." However, in most cases when you text 9-1-1 from a wireless phone, the call taker will not receive this automated information. For this reason, if you send a text message to 9-1-1, it is important to give the 9-1-1 call taker an accurate address or location as quickly as possible, if you can. Question: How will I know if the service is not available? If your device is not connected to a tower with Text to 9-1-1 service you will receive a message that Text to 9-1-1 service is not available and you should make a voice call or use a relay service. This PSAP does receive a number of 9-1-1 calls where the caller disconnects with the dispatcher before speaking with anyone. The majority of these hang-up calls are by error but in some instances are discovered to be true emergencies. It is important for the caller to stay on the line in the event of an error. The dispatcher will need to gain as much information about the call before passing it along to patrol officers. The policy of the Newton Police Department is that we will investigate every hang-up 9-1-1 call to ensure that no emergency exists. During a large scale emergency which requires a large number of resources, dispatchers play an important role in coordinating units as they are responding to the scene. 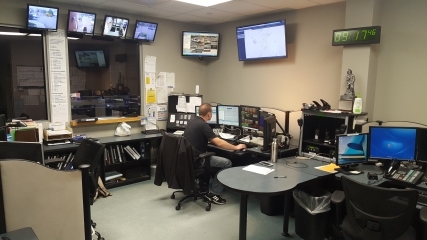 Conversely, during a time that emergency units are unavailable or already committed to other incidents, dispatchers employ the agency’s mutual aid protocol to summons nearby available units that can assist. Every dispatcher receives special training in receiving and handling emergency calls. Each is also trained in providing emergency medical instructions over the phone to individuals who can or are willing to try to assist in a medical emergency or other hazardous condition. The Communications Center utilizes approved Emergency Medical Guide Cards in providing such instructions. To date these emergency protocols have been used successfully in medical emergencies involving heart attacks, stroke, shock, allergic reactions and childbirth. Once training is completed a dispatcher will be assigned to a veteran dispatcher for field training where the skills learned through basic training are refined and applied to real life situations. Several full and part-time dispatchers have additional certifications and training as fire fighters and emergency medical technicians and are part of local emergency service organizations in their own communities. 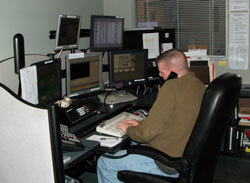 Many police officers begin their career in public safety as a dispatcher. If interested in a position, visit our employment page or contact Lt. Mark Zappa at (973) 383-2525 or mzappa@newtonpolice.org.